HomeWeb DesignIs your website leaking ? Is your website as effective as you’d like ? Or are visitor’s bouncing off ? or if they get confused. 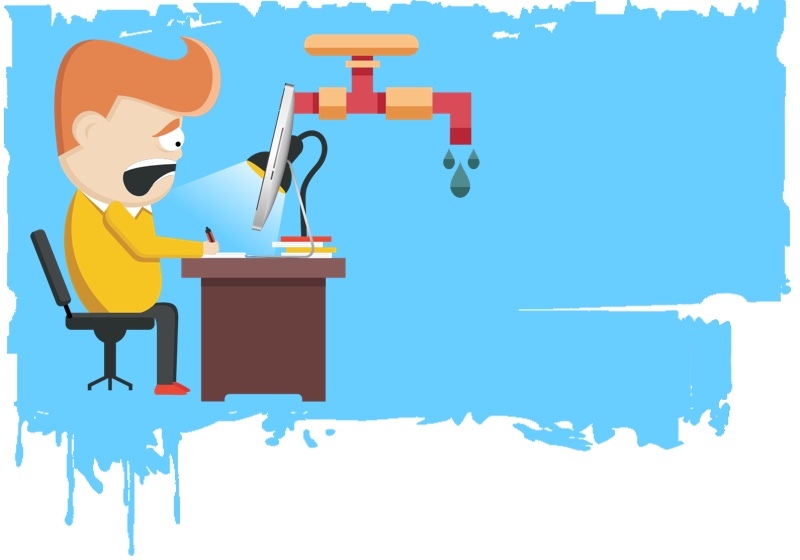 Most business websites are leaking their visitors left, right and centre. The solution is to realise that a website delivers part of a conversation ( because most people arrive at a website from an earlier thing, like an add or an email link ). Then make sure that the entire conversation stays on the same subject and makes sense. The page they land on doesn’t match what’s said in the ad or in the email. There’s no cool offer on your website regarding what brought them there! The website structure sends people all over the shop. You’re not finding out what they want in the first place. Do you notice it when ads on Facebook or in Google don’t really connect with the page they click through to ? For a start, lots of businesses send the clicks from their ads to their home page. For example, I searched for surfboards for sale. Look at the following ad that clicks through to the Sideways Surf Outlets website. The page that I landed on had an offer that didn’t click anywhere else and gave me a choice between skateboards, surf and accessories. But if I wanted to buy a surfboard fast, I’d leave and go back to Google. 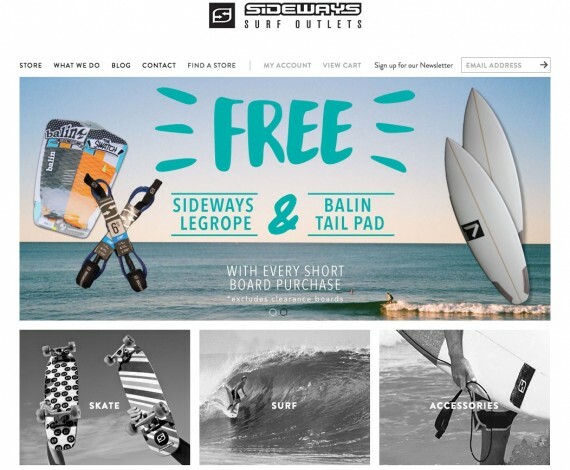 A better landing page would be one that shows some of the cool surfboards for sale and offers a coupon or discount if I enter my email address to download their product-specs brochure. Similar to the best ways to handle a prospect offline, once you know what the person wants ( in this case to buy a surfboard ) you then need to control them though the steps to get it. Control can be really nice – it’s not bad by default. For example I have a mate who bought a property in Aukland recently. He was super happy with the way the real-estate agent took control and controlled him through every step of the way until he got exactly what he wanted. Keep pictures the same. A different picture in the add to what they see when they get to the page can confuse people and sometimes they don’t realise they’ve got to the correct place. Maintaining a similar feel ( sometimes called ad-scent ) keeps people moving smoothly. Make messages connect. The sentence and message on a page should follow on from what was said in the add or previous page. You wouldn’t continue speaking to a live person if the sentences didn’t connect ! (2) No cool offer !!! When people get to your website do you offer or encourage them to leave an email address or phone you up !?! Not doing this is a BIG mistake. If you don’t have an offer on your site, get one up fast. If you’ve had your business for a while, one fast start is to take a guess at what people want when they visit your site. 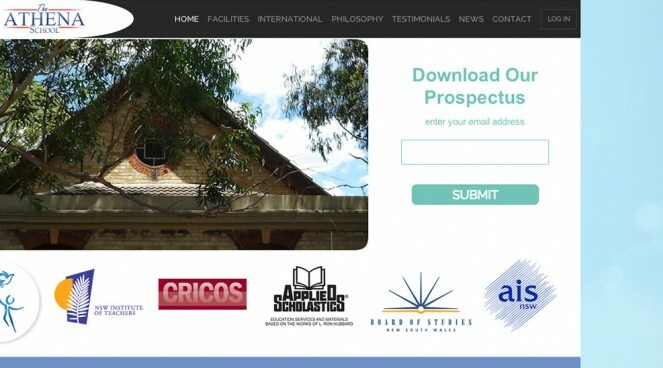 Parents looking for a private school for their kids wanted a prospectus and this opt-in box to download one provides the school with a constant flow of leads. Do you have icons at the top of the page that encourage people to go to Facebook, Linked In and other places ? Does your website navigation or menu make it hard for people to navigate around ? Don’t do those things ! Decide where your main presence on the internet is. Usually it’s the business website that’s the hub. So direct people THERE from everywhere else by linking to it from directories, Facebook, LinkedIn etc. Not the other way around. (4) No follow up system. If you’ve collected someone’s email address ( and especially if you know what they were interested in when they left it for you ) then email them some more relevant info. If you’re advertising with Facebook or Google, add one of their retargeting pixels to your website pages. These leave a cookie in people’s browsers so that you can have relevant ads appear elsewhere for them. If you’re trying to sell people something they’re not interested in, it’s pretty hard work. First you need to find out what they want and what they need. Marketers have know for hundreds of years that if you repeat back to people what they’ve told you they want, you get more interest and sales. And if you provide what they need and want, you’ll do even better ! Improving how well your website works can be done by first watching what happens when people get your website, which is what an analytics program or service can do. Then you can test individual pages to improve their performance. Google Analytics is the best know one ( and it’s free ). My favourite analytics program is Matomo. Visitor flow in either allows you to view how people move through your website and which pages they drop off from. You can highlight different pages to trace paths through the site. You find out a lot about what’s happening on an particular website page by using heat-map tracking and session recording covered in this post about heat maps and session recording. Want to reduce the learning curve and get the basic things set up correctly ? Get a copy of this Online Business Flowchart so you can see how everything should fit together.